The East Africa Peace Service Corps (EAPSC) was officially launched at the United Nations Headquarters in Gigiri, Nairobi, Kenya by Kenyan Prime Minister Raila Odinga at the close of the two-day “Africa Conference on Volunteer Action for Peace and Development,” held on July 2 -4, 2012. The EAPSC was inspired by the Nairobi Declaration signed by delegates from 40 nations at the Kenyatta International Conference Centre during the 2010 Global Peace Convention under the patronage of Kenyan President H.E. Mwai Kibaki. The Gigiri conference placed strong focus on the role of youth voluntary service and regional volunteer exchange programs in fostering regional integration and community-centered sustainable development in East Africa and throughout the continent. EAPSC is a broad-based partnership of 25 foundations, national ministries, service organizations, financial institutions, UN agencies and other stakeholders. 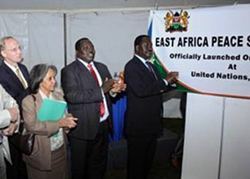 The Africa Union, Common Market of Eastern and Southern Africa and East African Community, representing over 20 nations, joined in support of the EAPSC launch. Key speakers and government officers noted that the vision of a cross-border service corps came from the Global Peace Convention 2010, and gave special thanks to the Global Peace Festival Foundation and GPFF Africa Regional Council Chair Dr. Manu Chandaria, who has been instrumental in building support for EAPSC following the signing of the Nairobi Declaration. 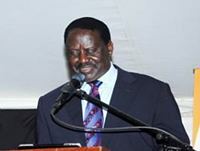 In his concluding keynote speech, Prime Minister Odinga noted that founding fathers for independence in the twentieth century, such as Nelson Mandela and Mahatma Gandhi, were volunteers. He summoned the youth of Africa to rise up in service to their nations to create the true wealth of Africa, and noted how fresh and innovative the East Africa Peace Service Corps approach is welcomed in Kenya. From top left: Ms. Rosemary Odinga, Director, Raila Education Centre; Hon. Musa Sirma, Minister for East Africa Community; Mr. Tapiwa Kamuruko, Deputy Chief Africa Region,United Nations Volunteers; Dr. Manu Chandaria, Chairman of Comcraft Group; Ms. Rachel Gathoni, Foundation Manager, KCB Foundation; and Ms. Katherine Ellis, Head of Youth Affairs, Commonwealth Secretariat. The Global Peace Festival Foundation and the Global Peace Youth Corps-Kenya Chapter played a key role in launching the EAPSC through building broad based public, private, non-governmental and donor partnerships, and networks at the national and regional levels. GPFF and GPYC provided technical support, mobilized volunteers, and with GP Connect supported a social media campaign to engage youth with the vision of volunteer service. GPFF Kenya Director of Strategic Partnerships Vincent Rapando served as the conference Secretary General.